Eric and Lei got in touch for help with their first home in Sanderstead, Croydon. They simply sent a text to see if I would be able to help them, and the rest is history! 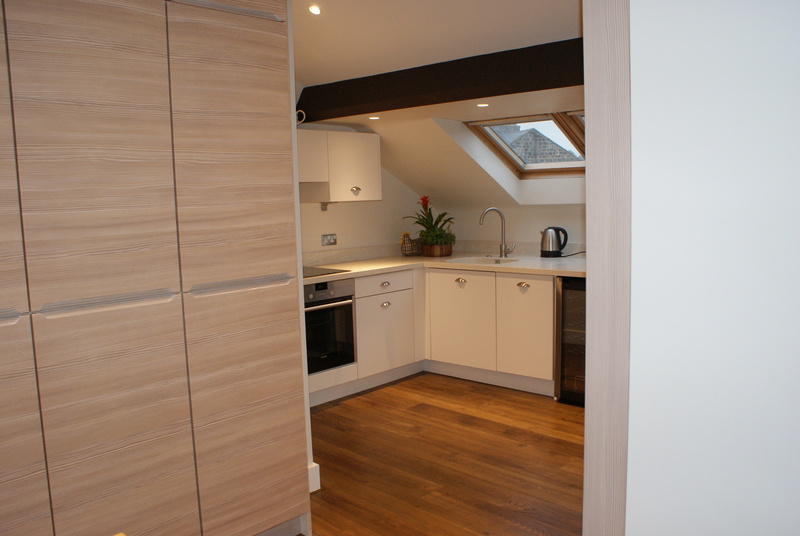 The house hadn't been renovated for many years and needed a complete refurbishment. Lei loved the warm, cream colours she'd seen in our previous projects and wanted something quite traditional but not old fashioned. 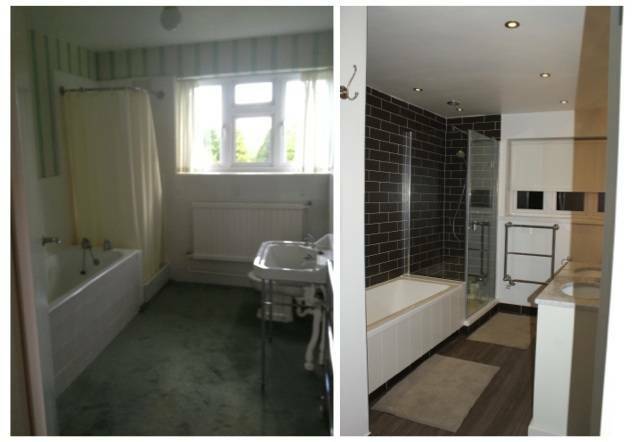 Working with them on 4 rooms, the transformation from the house they bought in to their own home is just amazing! Working with the colours Lei liked, we identified key area of socud for the room and adding interest through wallpapered sections throughout. 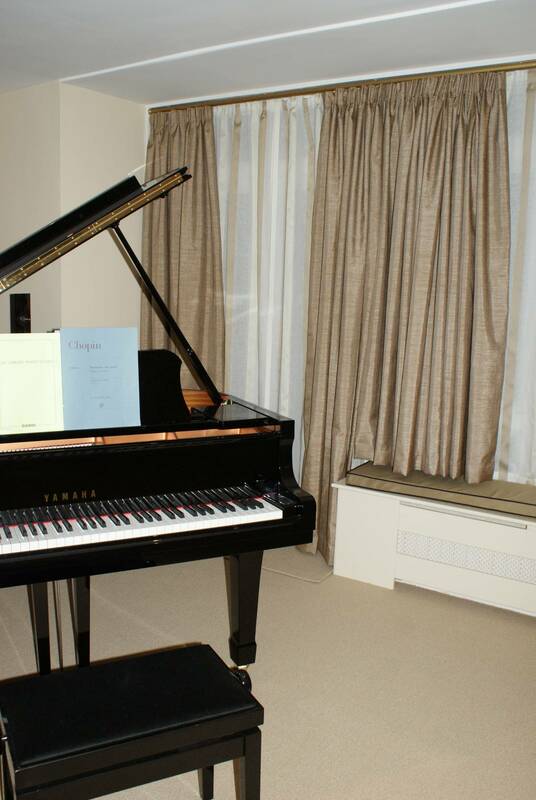 The beautiful baby grand piano adds real prominence to the room and the decoration had to enhance this as a real feature of the room. The living room is a large l-shape with a window taking up all of the longest wall, giving a fantastic view of the garden. However at night, this black space outside can be a little daunting. The window treatment we designed gave tons of flexibility – lightweight sheers provide privacy at night so the curtains don’t always have to be closed, ensuring the the room isn’t swamped by a vast wall of fabric on one side. Using a bespoke, made to measure radiator cover, we turned the window sil and radiator area into a lovely window seat – a far better use of budget than replacing all of this dated section. 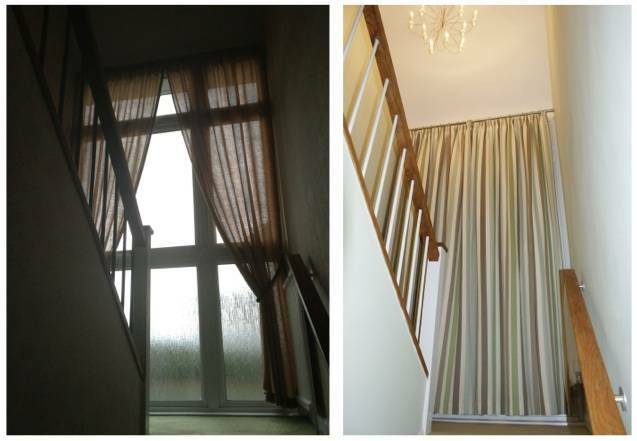 The before and after photos that follow show how something quite simple can completely transform the room! 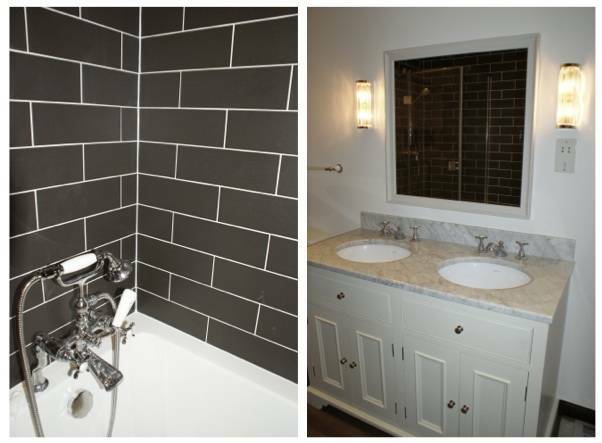 Lei wanted a traditional bathroom and a vintage feel to it – not a problem! 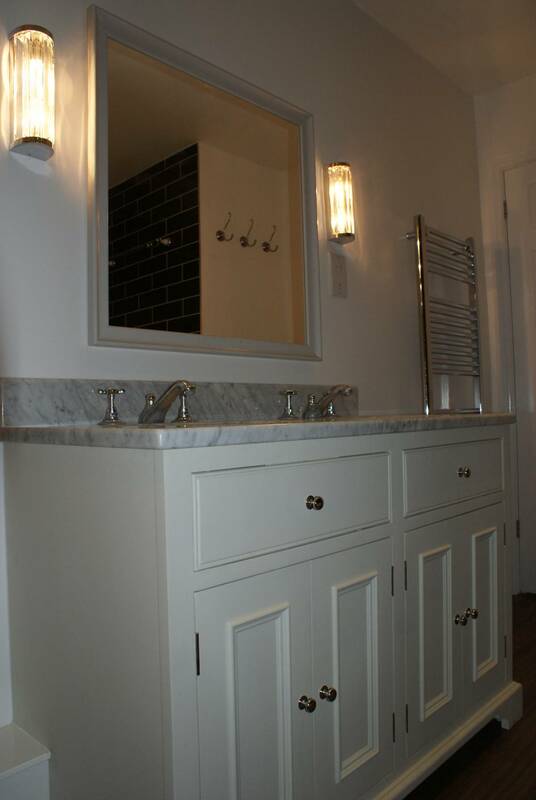 With period style fittings running alongside more modern elements like the shower cubicle and Amtico flooring for functionality, the bathroom looks stunning and just a little bit glam! To make the hallway brighter, we used a lovely light green paint paired with white woodwork to create a lovely cosy hallway. The large window at the front needed to be made a feature of and the new curtains and modern chandelier set this off perfectly. 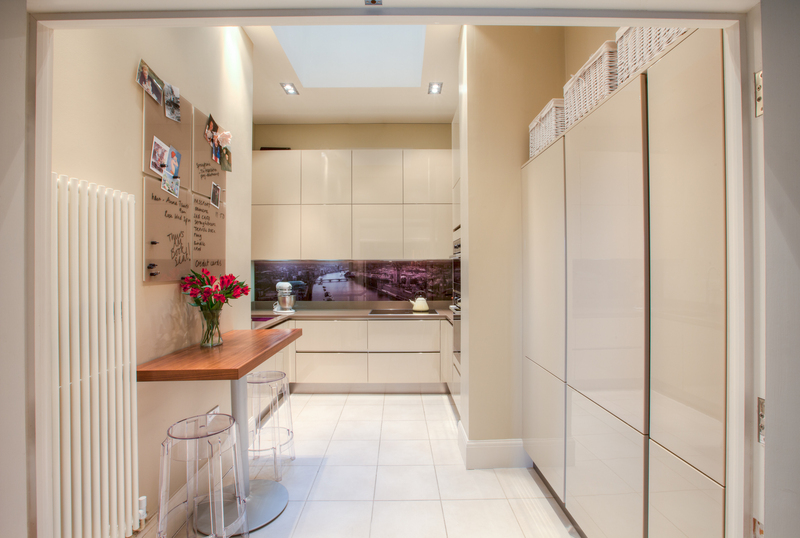 On Anna’s advice, Lei opted to move the wardrobes from the master bedroom in to the adjoining study room, so that they could make the most of the space in the bedroom without it being cramped. Lei had already ordered the bed and wanted a colour scheme and window treatment to work with this. 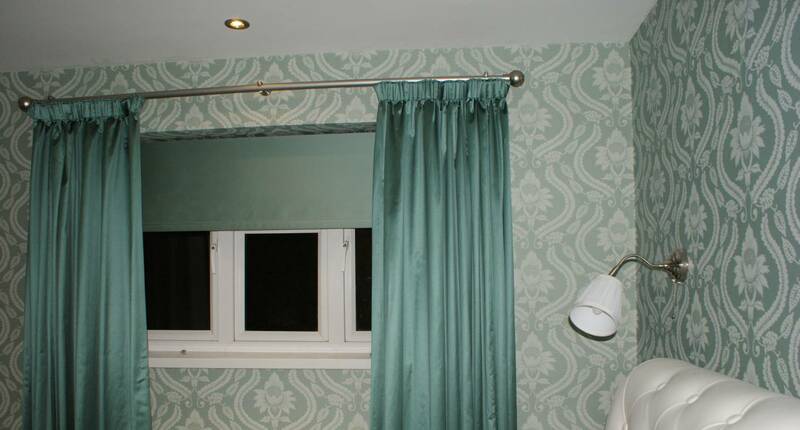 The blind and curtain combination adds glamour to the room but from a practical point of view also ensures total blackout – perfect for lie ins. The scheme was also chosen with a nod to the more traditional patterns, but brought to date with modern colours. So there we go, a 1950’s interior made contemporary with a hint of vintage, maximising Eric and Lei’s budget to create a really lovely new home for them both to settle in to.